What often is not said, is that boys “need” to be boys. I have been a mother to a son for only a year, but it doesn’t take long to realize how different boys are from their counterparts. God knew what he was doing when he broke this mama in slow to the realization that kids need dirt, need adventure, need freedom in the great outdoors. Our first daughter, Lord love her, wasn’t allowed to hold sticks for very long let alone gnaw on them. She wasn’t allowed to climb furniture, thankfully she never really tried. If a pacifier hit the floor, it was washed. Generally speaking she wasn’t allowed to be dirty for too long. Poor thing, I was a terrible mother. But surprisingly enough….she lived. Kids are pretty resilient that way. Then along came Autumn. I thought I had this whole mothering thing down. I mean…she was a girl, Alli was a girl. Pretty simple, I had already been there done that. If only. God has such a sense of humor, everything I thought I knew about raising girls didn’t apply to this sweet little pumpkin pie. If something had worked with Alli like how to rock her to sleep, how to get her to eat, how to keep her occupied… Autumn needed the opposite. It was a fast learning curve but I realize now she was just another tool God used to slowly teach me how to be a mother for a little man. Autumn loved to climb, loved to get into cabinets and had a severely strong sense of her own mind. That was me putting “stubborn” nicely. 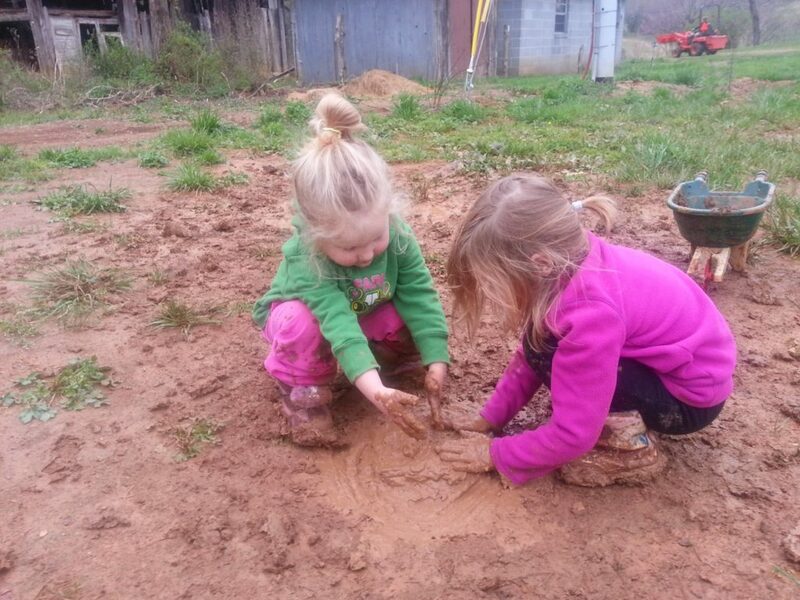 Both girls love to be princesses, but they love their mud pits too. Even after all the “mother training” I went through for 6 years, nothing completely prepared me to be a mother of a boy. I am not sure if you can tell or not but I am slightly OCD…with a touch of control freak. My poor husband. Y’all should say a prayer for him, I am sure he could use it. So here comes Logan into our sweet lives, the little ray of sunshine that he is…with his little energizer bunny batteries and all. He hit all of his baby milestones on average 2-3 months before his sisters. Rolling at 12 weeks, crawling at 5 months, standing at 6 months, walking at 10 months, running at 11 months. I am tired just writing it! Let’s just say I was totally unprepared for all that jazz. Hear me now…when I say not all boys will be this..eh..um..crazy. I am sure there is a spunky little girl or two out there as well who keeps their mamas on their toes. I am somewhat jealous of you moms out there with calm and collected little boys. I love my “Little Mans” and I wouldn’t trade him, but honestly I should probably be taking a nap while he is right now! But I would rather write about him instead and help a new/soon to be new mother of a little boy know they are not alone and it is okay to let boys be boys. I have realized that boys with the amount of energy that Logan has could be related to working dogs and their energy. Hear me out on this one. Caesar Milan is probably one of the most renown dog trainers in the U.S. There was a time in our life when we had a crazy, hyped up Labrador, so we watched every show Caesar put on trying to learn how to train our dog. One of the greatest things I took away from watching those shows was that most dogs weren’t being bad for the heck of it, they were just working dogs with nothing to do. Nothing to release their energy through. As soon as Caesar gave them a job, a purpose…those same irritating animals became calm, happy animals. One day in the throws of a screaming baby trying to climb me while I made dinner, I handed him a toy from the floor and I told him to put it away. Logan immediately stopped screaming turned around and put the toy away. He came back again and again for another toy to put away. I couldn’t believe it. It was at that moment I realized he needed a job to do. I watched him carefully after that. It didn’t always have to be a job I gave him, sometimes he made them up on his own….like dump out the entire bag of blocks, or pull all the DVDs out, get a book for his sister to read to him. Nine times out of ten, when Logan is getting fussy/needy I give him a job to do and his whole mood changes immediately. Today while I was outside with Logan I noticed he wasn’t always just happy to be outside. Up to that point I thought he just loved being outside. 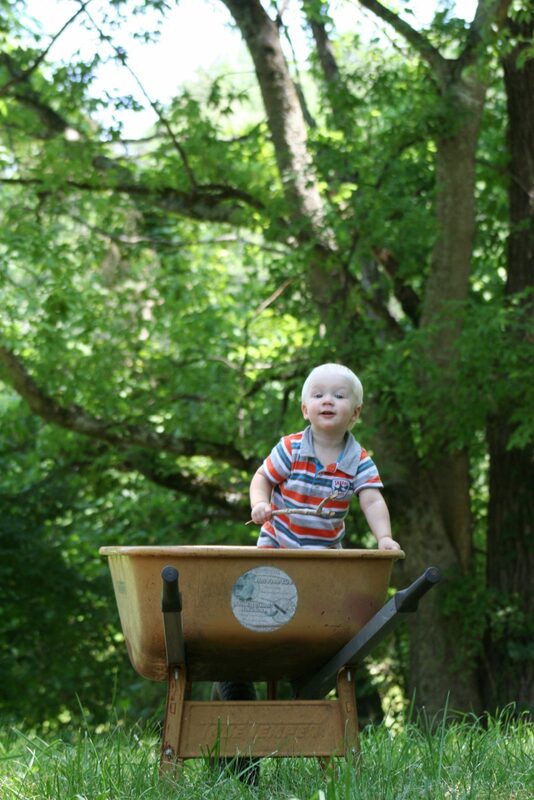 As I watched him I noticed he loved the grass, dirt and sticks, but he also wanted to help me move timbers. He couldn’t vocalize it but you know when your kids are happy. 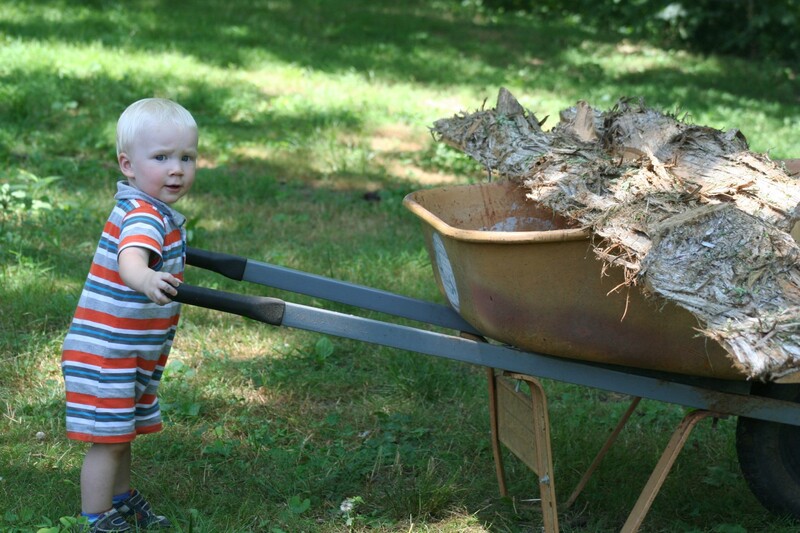 This boy of mine was the happiest when I asked him to help me with a stick, put something in the fire pit, or help me with the wheel barrel. He needed a job, a purpose and to feel useful. I believe most men are this way as well. Now I am not saying he wasn’t happy playing in the dirt and rubbing it all over his head at a friend’s house last week. I am just saying that boys “need” to be boys, whether that is putting mud on their face, pulling flowers up by the roots or picking up sticks for mommy. You don’t have to live on a farm to give your boys, or spunky girls this kind of life. You just need a little dirt patch, a park or a hiking trail. I love this life I have been given and I pray that I continue to be a better mother for my courageous little man that loves everything dirty. On that note I probably need to work on my artsy/craftsy issues for my girls. I have a severe aversion to anything glue, glitter, paint or play dough related indoors. Blame the aforementioned OCD, control freak issues. I don’t mind these crafts outside but its kinda hard to paint outside during the winter. Thankfully we have an awesome Nana who picks up my craft slack…glitter doesn’t scare her. Love this and completely agree! (I also have a major aversion but mainly just to glitter… and maybe dolls. So thankful for a MawMaw who loves girly things!) Thanks for sharing!